I don't mean the colour of the different lights, but the colour of the signal's structure itself. Yes generally speaking signals have always been galvanized or aluminum painted with the face of the target a flat black. The only exceptions I can think of are dwarf signals, which are frequently all black and occasionally all black signal bridges, particularly on the east coast. Thanks Mark ... As I wrote in a former topic, I bought dummy signals at Shapeways, here and there. And look at the cantilever signal, there is a groove in the bottom, so I designed a "concrete pedestal" , 3mm high, which fits perfectly. The french 3D printing company, "Sculpteo", has a grey polyamid finish which looks perfectly like concrete, I will use the same material fot the other signals ... The 4 dwarf signals in the "dead tracks" will be "kitbashed". These are PRR style signals. Researching today the PRR sleepers painted UP colors for the City trains (22 sec and 10-6...not what AZL has modeled) I noticed many of their "ordinary" signals were painted all black. Sorry, I read here that G type signals were used by NYC ; PRR had much more lights ... OK, they are too big, but they were converted from N-scale OPERATIONAL signals, initially designed for SMD Led's. In the 80's, I had (N-Scale) operational signals, which were much bigger : Brawa's models, with ... bulbs ! I’ll be curious to see how many creative licenses are spotted in the lightweight project. Tactical choices had to be made to bring this project to market on a cost effective basis. Many of the cars are based on UP prototypes (this we released the UP first) but not all. The biggest challenge with the lightweights is in how few cars were a standard design. I went with the early 4-4-2 and 6-6-4 sleepers because they were built during the Pullman era, and thus fairly standard amongst the railroads that were assigned, and eventually owned them. The observation car is the American Milemaster - one of the first of its type. The coach is a standard 44 seat long distance coach unit. If I get any of these details wrong, I did the research over two years ago and I’m doing this from memory while on holiday. This project this gives your imagination some fuel for what comes next from AZL! Sorry, I'm a west coast guy. Everything east of the Mississippi River is PRR to me. Aren't there any books on signals? I'm looking for Union Pacific style signals! I have several books on the subject, I'll dig them out and get the titles. What era are you interested in? I'm aware of three different styles depending on the era. Thanks Mark ... Exactly 1964 -65. While you're at it Mark... UP around 1955 Major thanks in advance. I ran across a couple of videos that may be of use, particularly for those not familiar with the details of U.S. equipment. Well I found one of my books: "Railroad Signaling" by Brian Solomon and a few others for reference images. Here's what I have. For UP they were running mostly upper quadrant, right handed semaphores (blade motion is from 12 to 3 o'clock positions, train obeys the right hand flag) through the 1950s, slowly converting to searchlights with CTC in the 1960s. Semaphores were operating at least into 1981 on some routes. About 2000 they started converting to the hooded "Darth Vader" 3 element signals. Alberich as always your answer is interesting. The only clear reference I have to NH is that they used left-handed upper quadrant semaphores with stubby blades into the 1960s. B&M used lower quadrant (3 to 6 o'clock) right-handed semaphores, transitioning to color-light (1 to 3 colored bulbs in a round target) to searchlight over the 1950s and 1960s. PRR used the position lights (colored lights that simulated the position of a semaphore blade), still in use today. So you have a lot of possibilities. It's important to note that for most railroads the transitioning from one signaling type to another took decades, B&M was still using ball-on-A-line signaling into the late 1950s. A Hall disk, the earliest electric signal was still being used on an SP line in 1980. So a lot depends on the location you want to model and really just your preference. Thanks Mark ... Because I decided to use dummy, non-operational signals, semaphores would look silly. 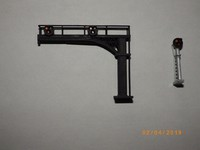 So I decided to use G-type light signalling, in service at NYC (I run both NH and NYC trains), I found them at Shapeways, both "standard" signals and cantilever bridges : a friendly modeller modified his N-scale versions. And, as You wrote, simple signals will be sprayed silver with the front of the target black, and cantilever bridges full black. (Designs by "Tabear" on Shapeways). I'll add "concrete" pedestals (3D printed in grey polyamide at Sculpteo, France). Since paint used for lights is "glossy", colours can't be seen well with the flash.